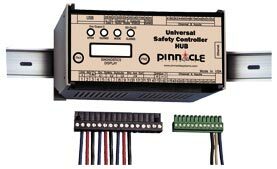 The Safety Relay HUB from Pinnacle Systems replaces multiple individual freestanding safety relay modules into one completely integrated and multi-faceted safety center. The programmable Safety Relay HUB contains a multitude of input wiring provisions for various safety devices that will be incorporated on the machine to be guarded or controlled. The Safety Relay HUB also contains dry contact safety relays and solid-state outputs in one complete, compact control reliable safety controller package. This provides ease of installation, improved safety and economic improvement on both installation and hardware cost. Typical safety device inputs that can be monitored and controlled by the Safety Relay HUB are: safety interlock switches (all types), safety light curtains, E-stop switches, cable – pull switches, safety mats, muting systems, operator two hand controls which contains anti-tie down/ concurrency logic functions, EDM (External Device Monitoring) and much more. • The Safety Relay HUB has 24 safety input terminals that can utilize safety or non-safety devices. (Expandable). • The Safety Relay HUB can monitor an input signal or provide 24 VDC when needed. • Inputs can be NPN sinking/ground or PNP sourcing /+24VDC. • Monitored mechanical captive contact safety relay outputs (dry) are built-in standard within the safety HUB. • Monitored solid state outputs are built-in the safety HUB. • Safety Channels A and B are both pulsed independently and sequentially to protect from component and internal shorts of 4 wire E-stop devices. • No dip switches for inadvertent tampering of safety circuit, outputs or ancillary functions! 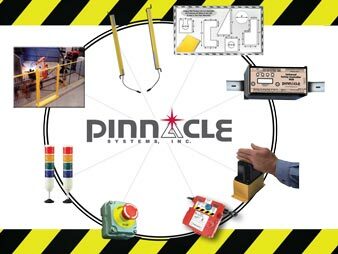 • No programming – Pinnacle Systems does everything for you! • Fault reset button on Safety HUB Controller front panel. • Manual relay reset button on Safety HUB Controller front panel. • Remote reset button – Uses any of the 24 safety inputs for remote reset away from the HUB. The Safety Relay HUB has built-in field replaceable captive (dry) contact safety relays. This is quite advantageous when compared to regular safety relay modules that require the entire module to be discarded and replaced when a single internal mechanical relay goes bad. The Safety Relay HUB is extremely cost efficient when compared to the total cost of using standard freestanding safety relays, their installation time and repair. The Safety Relay HUB contains USB Port, CAN Network and optional Ethernet connections. Control reliable resolver based (rotary and linear) position based systems available. Excellent for machine tools such as punch presses and press brakes (consult factory).